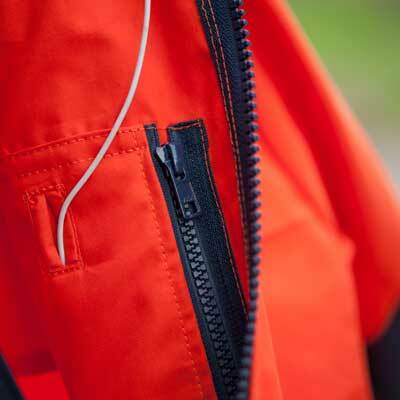 A fully featured Cotton Analogy® Jacket ideal for extreme conditions, especially when used in intense activity. The backs of the arms, elbows and shoulder areas are reinforced, providing increased wear resistance for carrying heavy rucksacks and skis. Waist, hood and hem adjustments protect from the ravages of weather. There are multiple pockets for storage of maps and all sorts of bits and pieces. The Askival Jacket is highly breathable and waterproof. Askival is the highest mountain on the Isle of Rhum on the West Coast of Scotland. Named by the Vikings, Askival means ‘Ash Tree Mountain’. Find out more in our Glossary. "As far as quality and appearances go, this jacket is first class and the workmanship is superb." Read one Hilltrek customer's review of the Askival Jacket in our Blog. The Askival Jacket is ideal for skiing, hillwalking or walking the dog on cold days. An alternative to the Cuillin Double Ventile® Jacket.